I recently had the opportunity to give a mini makeover to C’s best friend’s playroom using Target’s new kids decor line PillowFort. You may recall that I used a few of PillowFort’s lamps in C’s Kate Spade inspired bedroom earlier this year… So when approached to showcase the line in an entire room I knew the exact location. Our friend’s have a beautiful home and just refinished their basement. One of the spaces is their girls’ playroom. All of the kids love playing down here and being able to add in some fun decor brought the space to life. The goals were to make the space both fun and functional, which is important when you are designing for a three and five year old! I based the entire design around creating different zones for the girls. I think that their favorite was the activity table. 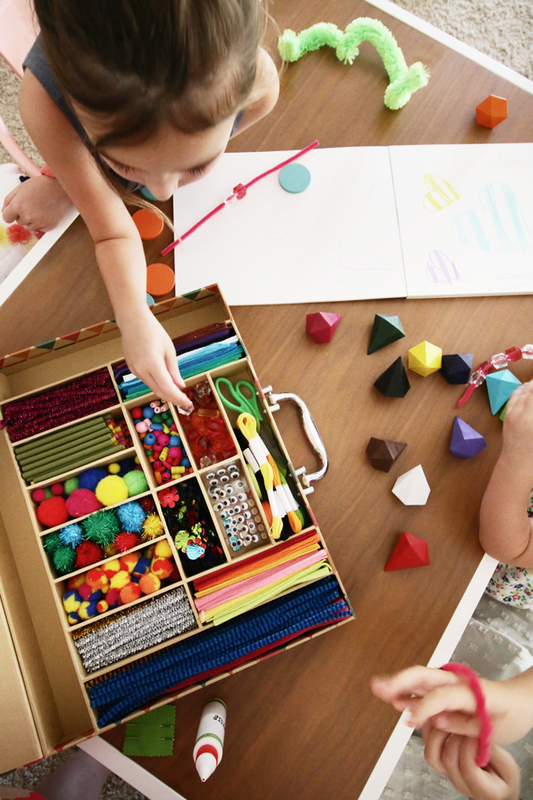 It’s modern lines and ample space makes for the perfect spot for little ones to craft and create. 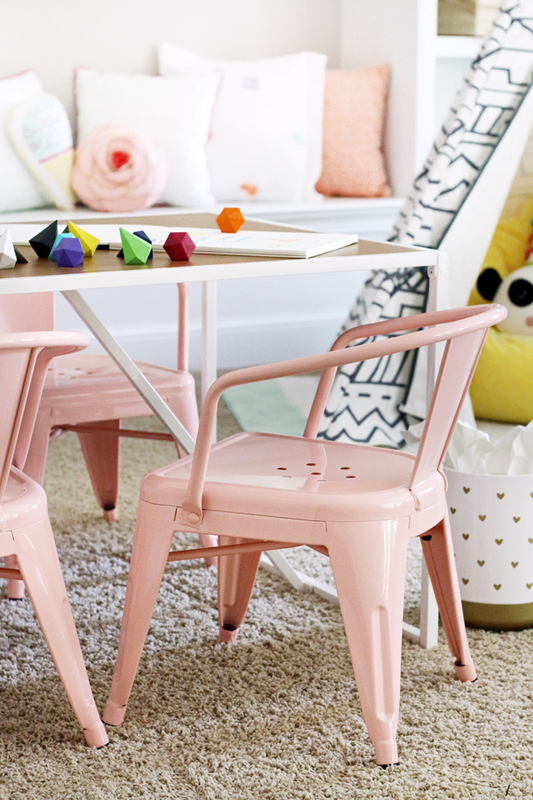 It comfortably seats four with these oh so cute kid sized industrial inspired chairs. 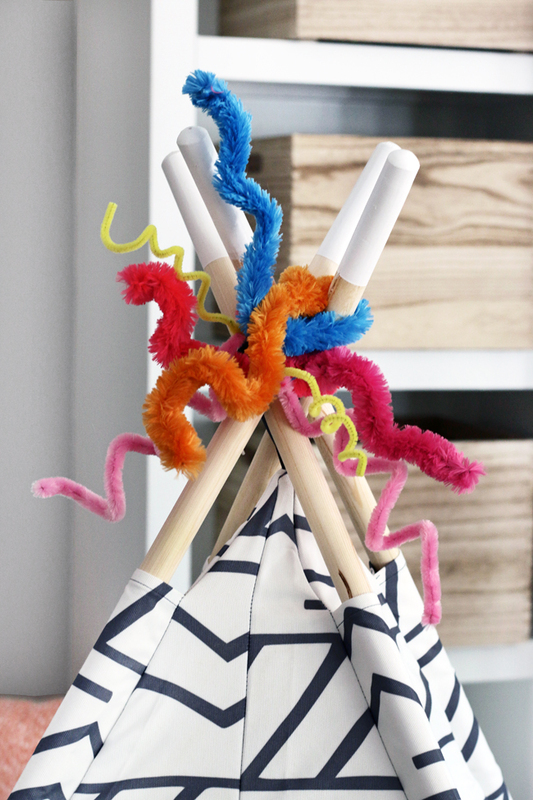 I had fun with the craft supplies too and added this fun giant pipe cleaner topper to the graphic teepee. Something the kids immediately picked up on! They loved that the beanbag fit into the teepee and it became the perfect little corner to read a book for my little beginning reader. She liked reading to the panda pillow (which was one of my favorite accessories from the collection!) 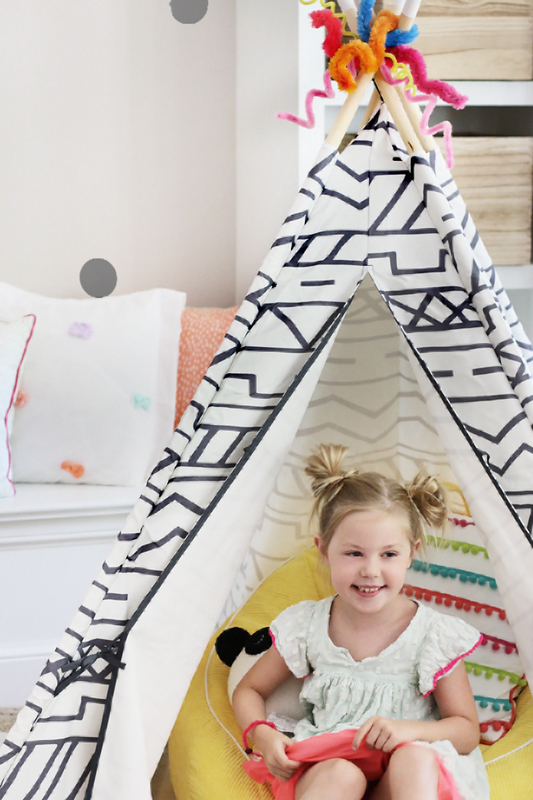 The soft striped rug was the perfect landing spot to define the teepee area. Creating storage within the builtins was a major necessity. 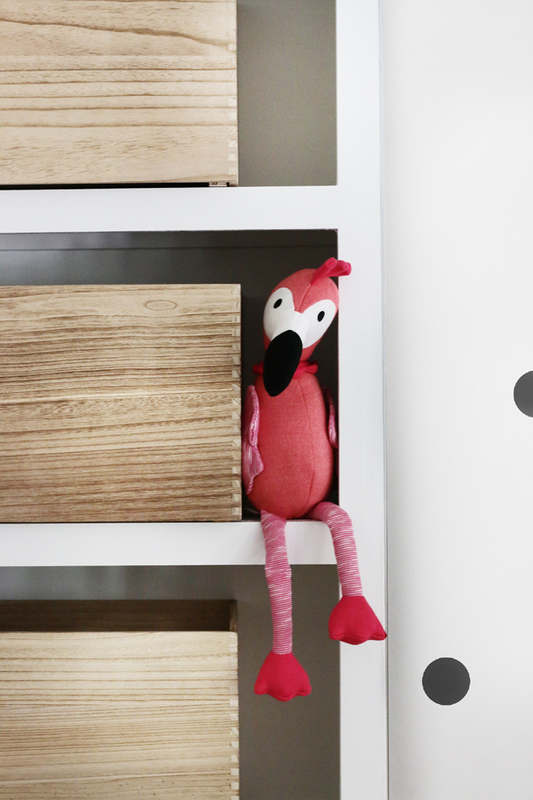 Using these surprisingly lightweight wood crates in the shelves added visual interest and plenty of storage for toys, books, and art supplies! Next I think we are going to add some fun labels to these as they are a blank canvas for creating your own design. 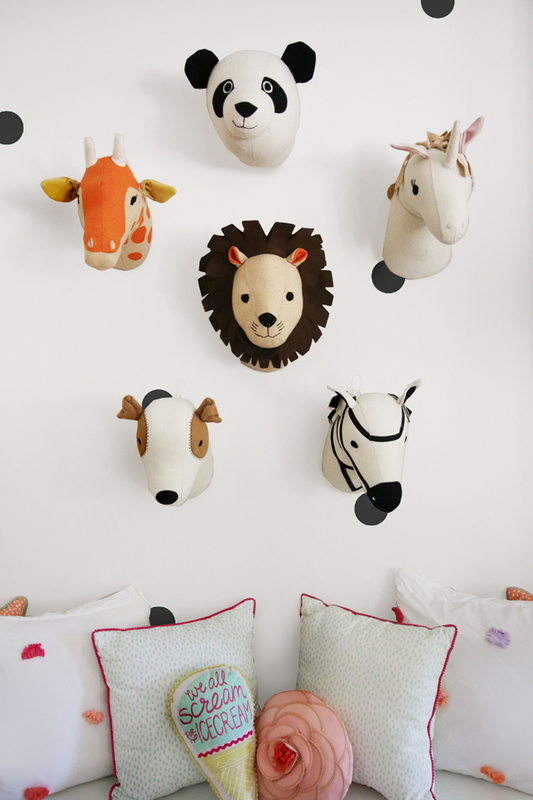 The entire design started with the idea of hanging a group of these adorable stuffed animals in a cluster as this was a large space to fill (and the focal point of the space!) I also added the polka dot wall decals in a random pattern to break up some of the symmetry. The unicorn won as the girls’ favorite, btw. Surprise, surprise! The storage bench incorporated into the builtins was screaming for PillowFort Pillows. And the best part about the entire line, is how every single piece works with the other. So there is no guessing at the store “Does this work with this? !” the answer is yes. They all work! I incorporated these fun pompom trim pillows in coral and mint along with two pillow shams from this comforter set. The comforter blanket makes for a fun impromptu play picnic blanket we later learned. 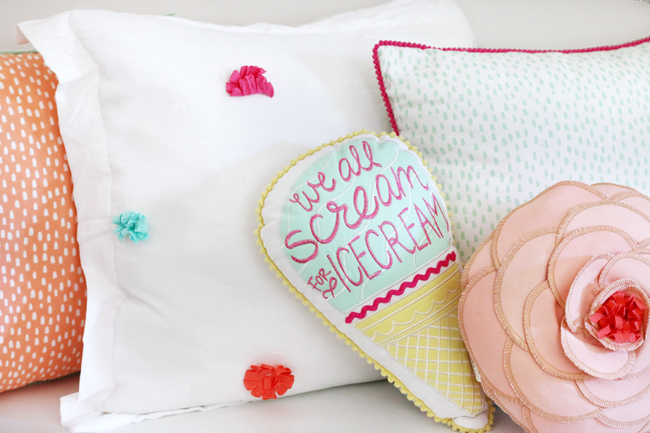 And these accent pillows are just the cutest. 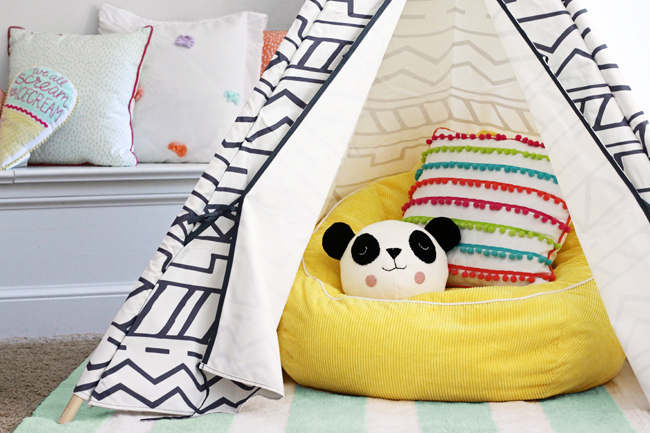 Be sure to check out how Cassie from Hi Sugarplum and Emily Clark styled their Pillowfort spaces too by checking out our feature on Good Housekeeping and Target’s blog, A Bullseye View. Thank you so much to Target for providing the Pillowfort items used in this makeover. All images and opinions are my own.